I know I know, I’ve been saying how much I love dark chocolate and would never settle for anything less. But sometimes you just got to bend the rules. White chocolate doesn’t rock my world, erm it doesn’t even cause as much of a rumble. Honestly, I don’t like the white. No offence, but once you’ve crossed the ‘dark’ side, there’s no turning back! I mean it. Okay, there are times where I just close one eye and pop the occasional exceptions into my mouth B-U-T nothing beats the bitter, darkest brown. So what’s the deal then you wonder? Ah hah. Swensen’s latest dessert offering: White Chocolate Blondie ($11.30) that is. That’s the deal. What’s a blondie you ask? Most of my friends are cluelesss about blondies. Well, blondies are actually the ‘white’ version of brownies. It’s more popular in the States. I know because I was enlightened by Nic of Bakingsheet when she sent me some, last year. Anyway, back to these blondies. Swensen’s serves these blondies on a hot sizzling pan with creamy rich butter maple syrup which is to die for. Diabetics, please please stay away from it. 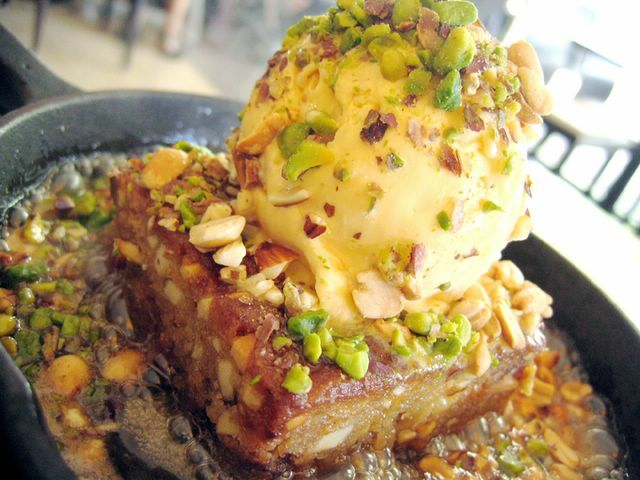 A scoop of simple vanilla ice cream accompanies the blondie and there’s also a generous sprinkling of nuts such as pistachios, almonds and peanuts. I love nuts and I have a sweet tooth. So whatever bias I had against the ‘white’ went out of the window. I stand changed. No no no, I’ve not converted. I’m still very much a person of the ‘dark’ side. It’s just that my experience with this blondie has let me to realise that white chocolate ain’t that bad. It could actually work! This Swensen’s dessert might be saccachrine sweet and too much for the average person, but hey, it’s a nice blend of textures and the degree of sweetness gives it a whole new dimension. The portion is generous and is good enough to satisfy your sweet cravings. I guarantee you’d want to come back and eat it with the love of your life if you haven’t already. The sweetness might just make your partner dizzy and so high that he’ll accede to your requests which might include that pair of Gucci shades eh? Go to Swensen’s website: www.swensens.com.sg for their store locations and full menu.